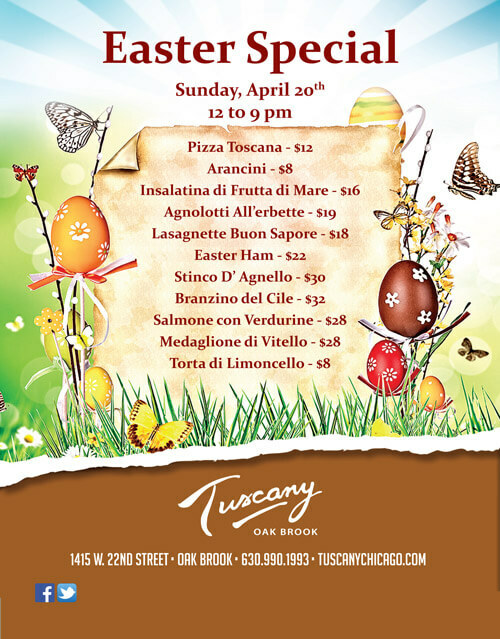 Join us for this Easter for a special Easter menu at Tuscany Restaurant in Oak Brook. Enjoy Easter this year with the people who mean the most, come together for a great meal and a good time at Tuscany Restaurant in Oak Brook. Special menu will be offered from noon until 9pm. We look forward to spending this Easter with you and your family and encourage you to make reservations. To book your table or learn more about the Easter Sunday Brunch at Tuscany Restaurant Wheeling, call (630) 990-1993.